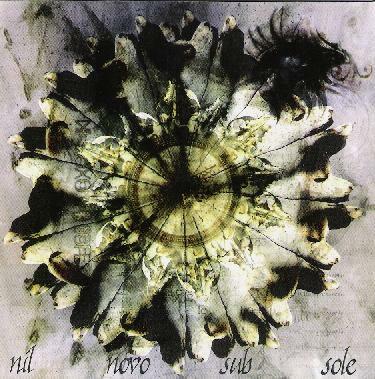 Nil - "Nil Novo Sub Sole"
Nil is a French progressive rock quintet who have released their second album - Nil Novo Sub Sole. The band consists of Roselyne Berthet on vocals, Benjamin Croizy on keyboards, David Maurin on guitars and flute, Samuel Maurin on bass and Stick, and Frank Niebel on drums, According to the promo sheet the band was primarily an instrumental outfit until only more recently adding Berthet on vocals. However, though Berthet is an excellent singer, the band remains, for the most part, primarily instrumental. The CD opens with the 20 minute epic "Le Gardien", which starts off with spacey keyboards, a slow melodic guitar pattern and Roselyne Berthet's flowing French language vocals. But it quickly launches into the main segment, which is an interesting blend of classic and avant-progressive rock influences. There are hints of RIO stylings at times, but even then the music is highly accessible, and combined with classic prog influences. I liked the spacey segments that serve as tension building devices. "Deregeneration" is the other lengthy track of the set and is heavier and more energetic than "Le Gardien". Nil are very good at creating brooding atmospherics. And some of the best instrumental sections of this track are like a hauntingly intense cross between Yes and Genesis, but with a metallic edge, though there are also dreamy keyboard and flute passages that keep things firmly in classic the progressive rock domain. "198" is a much ballsy metal-ish tune with some fiery guitar and keyboard parts. It's got the dark and foreboding transitional sections and tension building bits too, but it all really comes together nicely on this song. Definitely one of the most expressive and cohesive compositions on the album. "Abandon" and "Derives" are two more strong tracks that round out the set. In summary, I enjoyed Nil's style of progressive rock, which incorporates multiple influences from symphonic progressive, to metal, to spacey ambience, and even occasional smatterings of avant-prog. If you like continual changes in theme, rhythmic pace and atmosphere, these guys serve it up in heaps. For more information you can visit the Nil web site at: http://www.nilweb.com. Visit the Unicorn Digital web site at: http://www.unicornrecords.com.